Be sure to stop at Antler Hill Village and Farm during your Biltmore exploration. 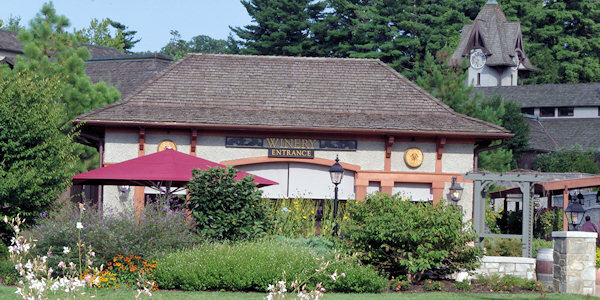 The most popular stop here is the Biltmore Winery for a tour and tasting. In addition, see a fascinating Vanderbilt exhibit, shop, arrange outdoor adventures and enjoy lunch or dinner at Cedric's or Bistro. And don't forget the Creamery for ice cream! The village is about two miles from the house, along the main road through the estate. Adjacent to the village is the Inn at Biltmore hotel. The estate's second hotel, Village Hotel on Biltmore Estate, opened in 2015. 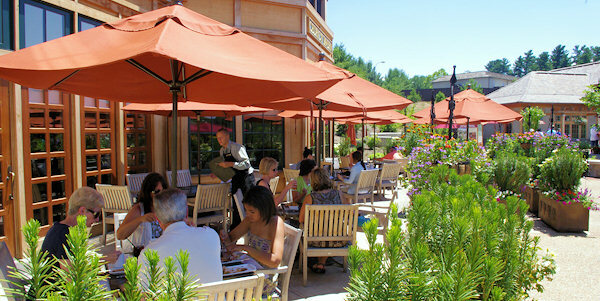 All attractions at Antler Hill Village are included in your daily admission to the estate. Plus, there are many excursions and special tours for an extra fee. Its name comes from Antler Hill, the “fine high ridge,” as noted by Vanderbilt. From the Civil War into the 1930s, the ridge was the site of Antler Hall, a residence and social center for many estate families. 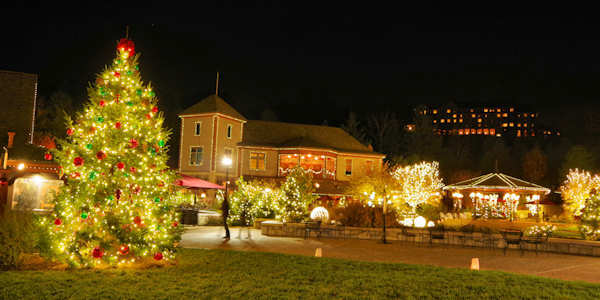 During the Christmas at Biltmore celebration, Antler Hill Village is decked out with many lights. Winery: Enter the Winery and walk underground through the old dairy’s original tunnel, learning about the winemaking process. Stop in the Tasting Room to sample many vintages (included in your admission ticket) or pay a little extra for a premium tasting. 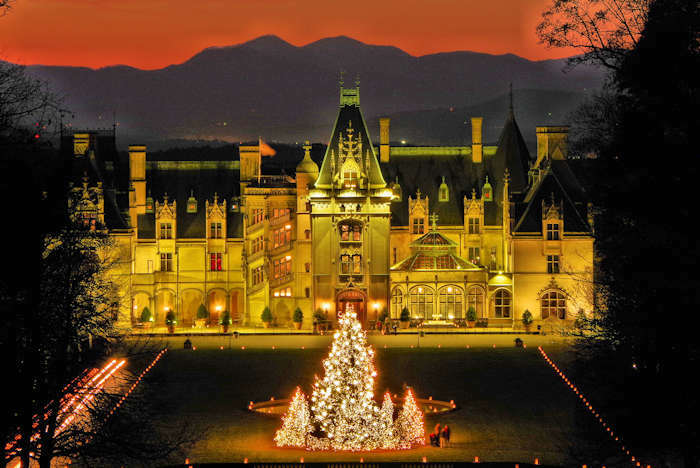 See our Biltmore Winery Guide. 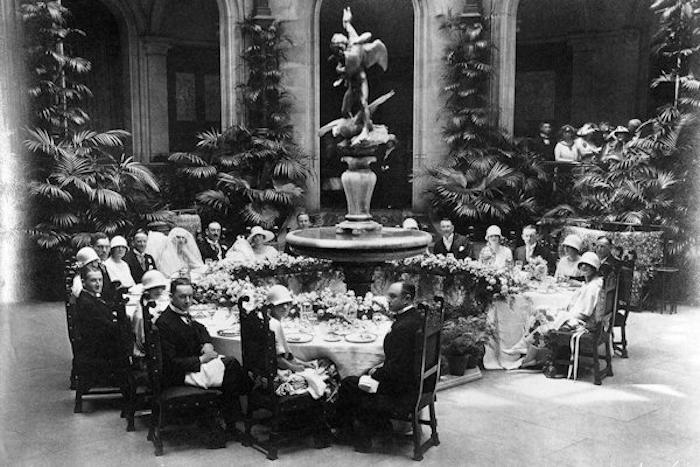 The Biltmore Legacy: See temporary exhibits that dives deeper into the Vanderbilt family history. No additional admission. 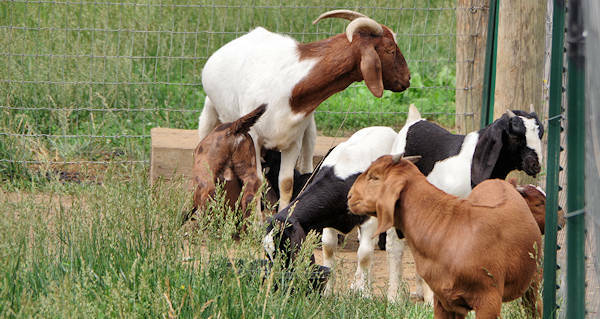 Farm at Antler Hill Village: The farm offers a glimpse back at Biltmore’s agricultural past with animals to delight children of all ages. Traditional farming demonstrations take place in the historic Barn, including authentic blacksmithing. Also see farm equipment and browse through the Barn Door shop. Outdoor Adventure Center: Sign up for all sorts of fun! Exploring the outdoors with Segway rentals, river trips, Land Rover excursions, bike trips, horseback rides, carriage rides and more. 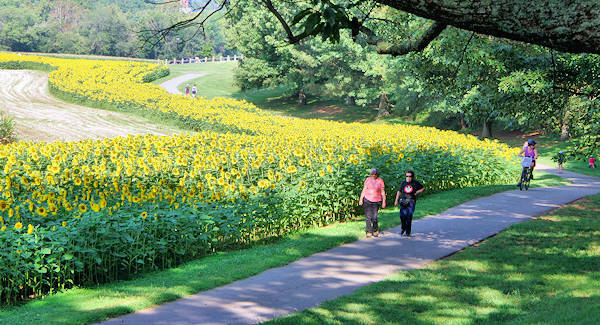 Read more about things to do outdoors at Biltmore. Hike and Bike: From the Village, find a network of paved and unpaved trails. Bring your bike or rent one at the Barn. The mile of sunflowers bloom in waves, usually in July and August. Stop by the Outdoor Adventure Center for a trail map. You can hike all the way to Biltmore House with wonderful views along the way (about 3 miles). Read more about Outdoors Fun at Biltmore. 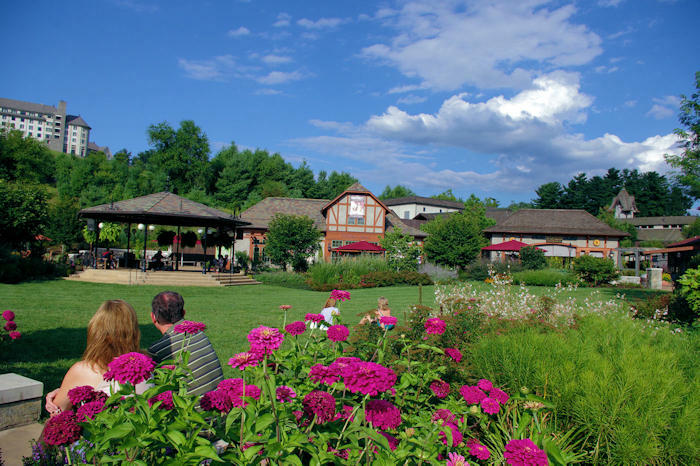 Village Green and Bandstand: The centerpiece is the Village Green with a gently sloping area perfect for people-watching, listening to live music many evenings, or relaxing with a snack or picnic. Traditions: Find decorative home accents and local artisans’ work, including pottery and jewelry. Wine Shop: Browse a complete selection of Biltmore wines, plus gourmet foods and cooking accessories - a must stop for gourmet cooks and those who love to entertain. The Mercantile: Find Appalachian crafts, dry goods and old-fashioned candy. Cedric’s Tavern: Named after George Vanderbilt’s beloved St. Bernard, Cedric, this warm, relaxing pub reflects the less formal side of Biltmore dining. Specialties include shepherd’s pie and fish and chips. Bistro: Located adjacent to the Winery, they place a strong emphasis on Biltmore's century-old field-to-table philosophy. Dishes include locally farmed mountain trout, locally sourced meats, local farmstead cheeses, and local honey. Using fresh ingredients from local producers, the menu changes to highlight what is currently in season. Creamery: A tribute to the original Biltmore Dairy Bar, indulge in Winky Bar sundaes, signature shakes and root beer floats, as well as gourmet coffee and pastries. The Smokehouse: Located in the Barn, find smoked pulled pork, beef and chicken; true Southern veggies; bread pudding and other desserts. 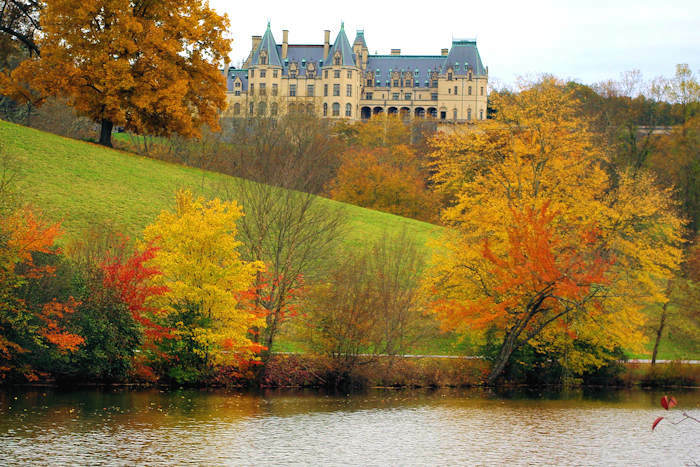 For more info on the estate, go to our overview, Biltmore Insider's Guide.